Today's Catechetical Moanin' isn't about the kids. They are doing great, actually. Fun, participating, being squirrelly, asking questions, figuring things out. No, today's moanin' is about "that" teacher. That teacher who's been doing this awhile. Who knows the curriculum inside and out. Who's got the lesson plans memorized. Who knows just what to expect from the children in the grade he/she teaches. 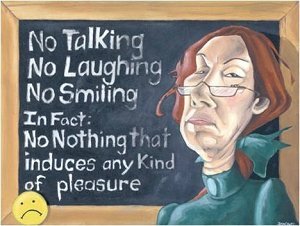 And has no joy in teaching at all. Nope, this guy/gal thinks today's kids are a hopeless mess - divorce abounds, they don't go to church, the parents don't care, society is going to hell in a handbasket and we're just along for the ride. No matter what we do, it won't stick, because Beyonce and Josh.O have got these kids by the throat and are not letting go. We're pushing a rock up a hill, over and over and over.....and it's just not going anywhere. Um, here's a thought: stop teaching. If this is you, and you do not have ABUNDANT JOY in sharing the faith and letting kids today know that there is Someone who loves them endlessly, boundlessly, and wants desperately to be in relationship with each and every one of them, then stop. Just stop. Please. The kids deserve better than your grumpy attitude, your defeated sighs, your thoughts that they just aren't going to "get it", no matter what. We ARE fighting an uphill battle against society - no doubt about it. But where else are the kids going to get the message of Christ's love for them? And if that message is wrapped up in a big ball of defeatist attitude and grim-faced determination to shove the 10 Commandments down their throats, then why WOULD they want it? Please. If you don't walk into your classroom every week with a song in your heart, a smile on your lips and the anticipation of something great taking place during each and every class, walk away. Each child deserves the joy of Christ. The abundant life of the Gospel. If you're not going to share that, step away.